With a dumbbell in each hand, sit on the end of a declined bench and rest the dumbbells on your knees. You can also get a training partner to hand you the dumbbells after you sit down. Hook your feet securely under the foot pads. Lie supine (on your back) and position the dumbbells to the sides of your chest, with your wrists pronated (facing away from you). Your elbows should be flexed and tucked into your sides a little. Exhale as you press the dumbbells upward and inward until your arms are almost fully extended and the dumbbells nearly touch. Inhale as you lower the dumbbells towards the starting position until you feel a mild stretch in your shoulders or chest. When you have finished the decline dumbbell bench press, gently rest the dumbbells on your thighs and sit up. Do not drop the dumbbells by your sides. To reduce the pressure on your shoulder joints and thus promote shoulder health, keep your elbows tucked into your body a little. 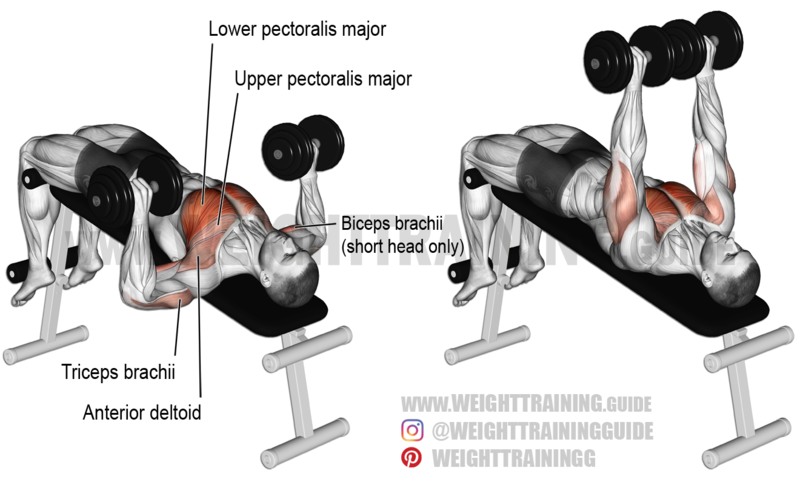 Compared with the dumbbell bench press, the decline dumbbell bench press places a little more emphasis on your sternal pectoralis major. You can perform the decline dumbbell press on the floor with very little loss of range of motion. See the second video. See also the decline hammer-grip dumbbell bench press, which can be easier on your shoulder joints. This site inspires me! Where is the gym .. Off I go! Good information. Lucky me I ran across your site by accident.